Burnout is more serious than just feeling stressed. It is a state of emotional, physical, and mental exhaustion caused by excessive and prolonged stress. When you are burned out, you feel overwhelmed, emotionally drained, and unable to meet the demands of your work and home life. You lose the interest and motivation in your job and other activities. Your productivity and energy plummet. Burnout is a gradual process. Left unaddressed, you become increasingly helpless, hopeless, cynical, and resentful—like you’ve got nothing more to give. What is the difference between stress and Burnout? Burnout is different from stress. In small doses, stress has many advantages. It can help you meet daily challenges. It motivates you to reach your goals. It can help you accomplish tasks more efficiently–and can even boost memory. There are even some health benefits of a little bit of stress. Researchers believe that some stress can help to fortify the immune system. It can improve how your heart works and protects your body from infection. Of course, too much stress is not desirable or healthy, but still it is less disabling that Burnout. The whole flavor and experience of burnout is markedly different from stress. Stressed people feel like there is too much going on. They may be too busy and overwhelmed, but (unlike folks who have progressed to the point of burnout), they still believe that they will feel better once they get everything under control. In contrast, people experiencing burnout feel like there’s not enough. They experience feelings of emptiness, mental exhaustion, lack of motivation or even caring, and hopelessness. Life seems not worth living. How to tell if you are stressed or Burned Out? Stress and Burnout look and feel very different. Here are some signs that wll help you to distinguish if your stress has tipped over into more serious Burnout. Burnout can arise from a variety of factors, including working conditions, lifestyle causes, and personality traits. As to personality factors, Type A’s and perfectionists run the risk of burnout. Likewise those who have a strong need to control, often accompanied by a reluctance to delegate, are at increased risk of burnout. People who lack trust in themselves or in the world may be predisposed to burnout. On top of that, the lifestyle choices we make can contribute to burnout. Too little sleep. Loss of work/life balance. Avoiding positive social contacts. Refusing to say no to more responsibilities, coupled with reluctance asking others for help. All of these choices can set you up for Burnout. What are the signs and symptoms of Burnout? 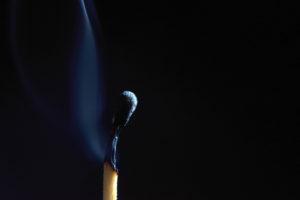 What can you do about Burnout? Don’t isolate. Social contact is an important way to mitigate feelings of Burnout. Share your feelings with your loved ones. Develop supportive relationships with co-workers. Look for opportunities to be with friends and build new friendships if necessary. Talking with a psychotherapist can also be of great benefit. Your therapist knows how to listen empathically to what you are going through. She can help you to identify and express your feelings as well as to examine and change patterns of thinking that are keeping you stuck in a burned out state. She can also help you to identify concrete steps that you can take to improve your inner and outer environments to improve the conditions that have contributed to your condition. If you believe you are heading towards burnout or are already fully in burnout, don’t suffer in silence. Take action to find support and relief now. Does Winter Make You “SAD”? SOCIAL ANXIETY: What does it look like? Mid-life: “Crisis” or Golden Opportunity for Renewal? The most powerful trend that I saw in my experience with Susan was a re-recognition of who my true self is and what my core values are. She really helped to tune me into my inner voices and desires in a way that I hadn’t been able to do for years. —Nicole C.
I have been working with Susan for almost a year now. It has been an amazing experience. It helped me so much to grow, expand, and find out how to be myself. I can feel deeply listened and supported in my healing process. I feel safe, respected, and empowered. It is a wonderful feeling of having the right to connect to my inner joy and aliveness, and of (finally!) trusting myself.—Agnes W.
Susan Lennox’s coaching style is intelligent and inspiring. In our year of coaching, she has helped me increase my productivity by forming new ways of thinking and problem-solving, reducing stress, and identifying personality indicators that are influencing my work and studies. By using different methods, she has helped me to understand and work with issues to resolve internal conflicts. She is committed to helping me leverage my personal leadership vision, and to develop my individual strengths. She has inspired me more times than I can count. –Kathryn B.
Susan helped me improve and capitalize on my self-efficacy which opened an entirely new window into my abilities. Susan assisted me in identifying and capitalizing on my best strengths in order to improve on my weakness. Susan truly helped unleash my talents and taught me how to apply them to maximize their situational effectiveness. My confidence, productivity and professional value has dramatically improved as a result. I found our sessions to be some of the most helpful in my career.” –Michael D.
Susan Lennox is a Certified Professional Coach and Psychotherapist registered in the State of Colorado. She offers life coaching, business coaching and psychotherapy both in person and by telephone or online.